CCTV footage shows a Mama and her kitten being dumped, trapped in a weighted box, then shows Mama freeing herself and her baby. The local SPCA is caring for the cats and pursuing an investigation with the intention to press cruelty charges. While there may be exceptions; mostly, the human heart is the same the world over. Animal lovers and others with caring hearts are showing concern in South Africa as a poignant case makes the news. A Mama cat showed determination to free herself and her kitten when they were left to die in a tiny box with a large, heavy rock on top. Mama saved both herself and her baby and won the hearts of many in doing so. After Mama cat and her kitten were discovered by a Riverhorse Valley, Durban security guard last Sunday, the guard called the SPCA. The SPCA is caring for the animals and investigating the case of dumping that brought them there and endangered their lives. CCTV footage shows what happened. Men drove up and left a box with the cat and kitten inside. Mama made her way out, investigated her surroundings, then went back to rescue her baby. The heavy rock meant to keep the animals from escaping fell into the box but, thankfully, neither Mama nor baby was hurt. Footage shows a car pulling up and three adult males and one minor male making their way to the boot, while looking around furtively. A box is pulled out. 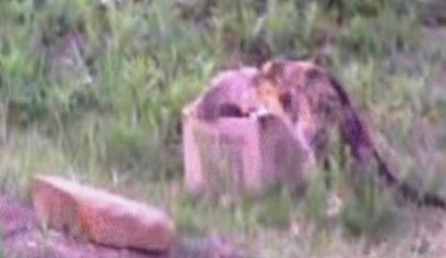 Two adult males cross the road and put the box down near bushes off a dirt pathway and place a large, heavy rock on top of box. The car leaves the scene. Camera zooms back to the box, movement seen. Shortly after, a cat pushes its head out from underneath rock and forces its way out of box. The cat stays close to the box, surveying its surroundings. Some passersby ignore the cat and the box. 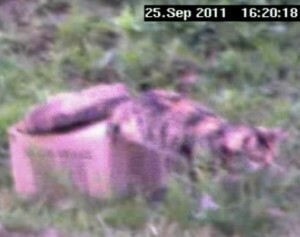 The cat moves across into the bushes to survey and within seconds is back, delving into the box. The rock falls into the box. The cat emerges holding a tiny kitten in her mouth and scuttles off into the bushes. On Monday, September 26, our Inspectorate received a call from a security company in Riverhorse Valley, concerned about a cat and kitten which had been dumped in the area the previous afternoon. Inspector Rupee went to the scene and found a box measuring 22cm squared (which is tiny considering that an adult cat and kitten were forced into it) with a rock in it. He was amazed to find the cat and the two-day-old kitten in the bushes nearby. Rupee was advised that the security company had captured everything on security cameras. He rescued the cat and kitten and brought them to our SPCA, where they were both found to be in good health, albeit that the mother was very stressed. The adult cat is a tortoiseshell and the kitten a tabby. Both mom and kitten are being sheltered here until the kitten is at least six weeks old, whereupon we will be in a position to try and find them a home. These cats are not feral, but extremely domesticated. The registration of the vehicle was visible on the footage and we have traced the vehicle. Inspector Rupee will be opening a case of cruelty with SAP today. Our Inspectors enforce the Animals Protection Act (APA) no. 71 of 1962. This legislation empowers our inspectors to instigate legal action against abusive and neglectful owners. If found guilty, the perpetrator could face up to three years’ imprisonment and/or a fine of R60 000. 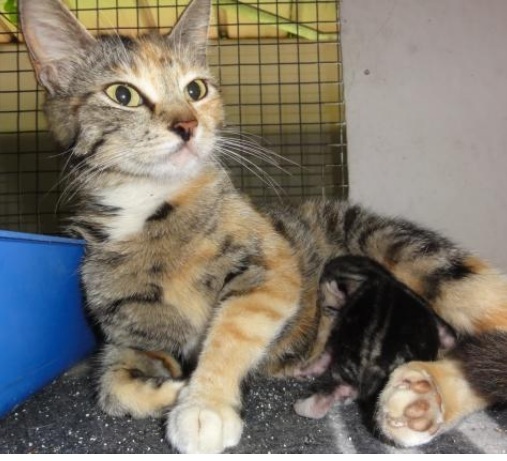 Ms. Smith of the Durban SPCA noted that the men could have brought Mama and kitten to the SPCA, with is nearby to the spot where they dumped them. 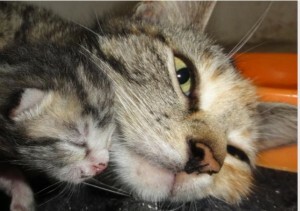 Public sentiment in South Africa ranges across sadness and concern that the cat and her kitten were dumped and left to die, to disapproval and anger at the men who left them, to warmhearted feelings toward the determined Mama who saved her own life and that of her baby. We echo those sentiments and add thanks to the SPCA for pursuing their mission by caring for the cats and going after the abusers. 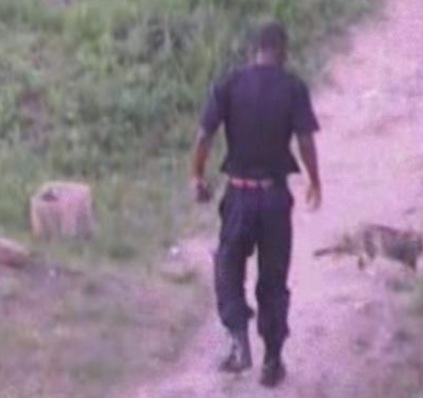 The perpetrator could get up to 3 years…they really take this seriously in South Africa. In my area in the USA they just turn the other way, rarely dose anyone here get prosecuted for abandoning animals, or even for neglect or abuse. It will be interesting to see what happens if they catch the folks who abandoned the kitties. Glad the kitties are safe now.
! I am also very pleased to know this was caught on tape for the world to see, seems like they should’ve known there was surveillance cameras watching them. It’s good to see South Africa takes this seriously, DebG is right people get away with what I consider ‘crimes against nature’ when it comes to (no)animal justice in the USA! Swift justice with jail time and a wallet full of cash, along with never being allowed to have cats or dogs for the remainder of their lives sounds fair to me! Good to see they’re now safe!! funny how a foreign country whom we never would have suspected have such hard animal cruelty laws. Sorry to say but many places in the world are much tougher than us about this where here animal cruelty is something light. if charged at all. someone will take her and the baby in for sure as it has raised such a stink. bless her and her kitty. I would take these two babies in a heartbeat, but hopefully someone closer will step up!!! Poor things!! !